Regional Director Gemma B. Gabuya of the Department of Social Welfare and Development Field Office III stressed during the Women Agenda Forum held in San Simon, Pampanga on March 28. 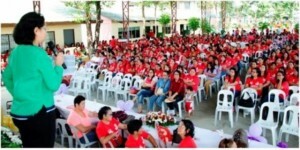 In her message before some 500 women of San Simon, Gabuya said that this is anchored on Republic Act 9710 or the Magna Carta of Women, a comprehensive women’s human rights law that seeks to eliminate discrimination against women by recognizing, protecting, fulfilling and promoting the rights of Filipino women, especially those in the marginalized sector. Director Gabuya tackled three salient features of the Law, namely, Comprehensive Women’s Health Care and Services, Social Protection for women in the Informal Economy and Gender and Culture Sensitivity of Educational and Trainings at All Levels. In her discussion of Comprehensive Women’s Health Care and Services, Gabuya said that women face health risks all throughout their life cycle. As a right of women, they should be treated in a humane, compassionate and non-judgmental manner when they seek health services. They should be provided with adequate awareness and information and access to affordable and quality health services, Gabuya added. Gabuya also stressed that in cases of violence against women and children, women and children victims and survivors shall be provided with comprehensive health services that include psychosocial, therapeutic, medical, and legal interventions and assistance towards healing, recovery, and empowerment. She also called on the health sector agencies to continue to provide for a comprehensive, culture-sensitive, and gender-responsive health services and programs covering all stages of a woman’s life cycle. This addresses the major causes of women’s mortality and morbidity, she said. She reminded also that women must maintain a healthy lifestyle and lauded the Local Government of San Simon for giving priority on that aspect. The Magna Carta of Women upholds the rights of workers in informal economy where majority of whom are women, Gabuya said in her discussion of Social Protection For women in the Informal Economy. Women are most likely to be required to balance the demands of domestic and child rearing activities. Women’s role to balance productive and reproductive work, women decide to tolerate small income, poor working conditions, she stressed. She also discussed existing laws and policies related to the issue and the enactment of Magna Carta of Workers in the Informal Economy (MCMIE). The MCWIE would be consistent with the International convention on Economic, social and Cultural Rights (ICESCR) which the Philippine Government ratified. It is also identified as priority legislative measure in the Social Development Chapter of the Philippine Development Plan. Gabuya lauded the local government of San Simon for putting-up a Learning Center for Women with the groundbreaking ceremony held earlier in the day. The center will be the venue of women activities such as skills training, Gender and Development training and other activities that will promote the rights and protection of women. Gabuya also cited the following contribution of the DSWD in the promotion of the rights and protection of women: 260,101 female grantees were served under the Pantawid Pamilyang Pilipino Program as of March 2016; 815 female grantees were served under the Modified Conditional Cash Transfer (MCCT); 23,354 women availed of services under the Sustainable Livelihood Program (SLP) in 2015; and 40,531 women served under the Social Pension for Indigent Senior Citizens (SPISCP).